Wrist flower tattoos are a popular style for many women. If you want a tattoo that's easily noticed without committing to a more intimate or larger space on your body, perhaps a wrist tattoo is the perfect choice. Take a look at these wrist flower tattoo ideas and get inspired for your own unique floral body art. When you combine the beauty of a flower with the edginess of a wrist tattoo you have a winning combination for a feminine and unique design. Flower tattoos remain a popular choice for many reasons. Adding to their obvious beauty is the individual meanings of he flowers. Some flowers represent love and friendship, while others have associations of new life and peace. While their personal significance may remain a secret, their beauty can be shared with others. 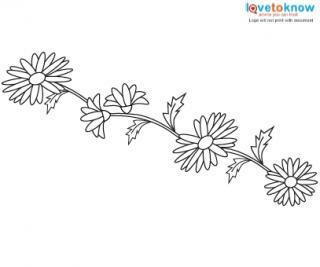 Whether you adore a certain blossom for its true beauty or appreciate the sentiment behind it, the following wrist tattoo ideas are perfect for brainstorming your first or next petaled tattoo. Rose and vines: A classic wrist tattoo is born when a rose and a wrapping vine come together. While there are plenty of variety of roses, each color signifying a different meaning, the most beloved of all is the timeless red rose. A red rose tattoo wrapped around your wrist is a romantic way to wear your favorite flower. A jumbled vine and thorns can create a cascading effect that mirrors the natural growth of a wild rose. 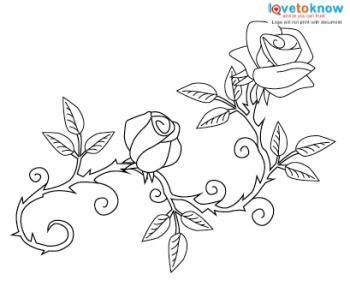 Add a rocker touch to your rose tattoo and consider adding barbed wire to the piece. Hawaiian flowers: Hawaiian flowers such as plumeria and gardenia are beautiful suggestions for a wrist tattoo. Wrap the stems around your wrist or allow a single blossom to take center stage on your inner wrist; it's entirely up to you. If you want a colorful and playful flower that suggests your love for the ocean and the big isle, a Hawaiian flower makes a likely choice. Daisy stems: For the more earthy gal, a daisy tattoo is a friendly yet approachable tattoo design. Single white petals with a cheerful yellow center are sure to become a happy piece of art when they're depicted on your wrist. While a single daisy stem makes it's own humble statement, why not consider a bunch of happy blossoms in a circlet for something different with an old world flair? Orchids: If your disposition is more artsy and reserved, you may appreciate the exotic beauty of an orchid. Whether your orchid tattoo symbolizes love and strength or uniquity, you'll find there are hundred of different orchid blossoms from which to choose. For the best selection, research orchid books at your local library and photocopy your favorite variety. When you meet with your tattoo artist, bring along your photo for a visual aide. While orchids come in a variety of colors, don't feel compelled to copy the blossoms; use your own imagination when depicting your flower tattoo. Rather than opt for a traditional hue, perhaps your orchid is more befit in a black and white statement making design? While a wrist tattoo has the perk of being small, it certainly makes a lasting impression. Before you commit to this area of body placement, ensure you'll have no regrets later. Bear in mind the wrist is one of the most visible areas of your body. Potential consequences should be considered. Not only is a wrist tattoo going to remain visible on a daily basis, its potential to affect employment should be a consideration. A tattoo should always be carefully considered. Take the time to meet with an artist and discuss wrist flower ideas before booking your ink appointment. Give thought and apprehension now to make all the difference in a tattoo that has everlasting meaning and beauty.